Groningen is an ambiguous title. Were you looking for Groningen, the city in the Netherlands? Groningen is the northernmost province of the Netherlands. Its capital city is also called Groningen. This name comes from a town called, 'villa Cruoninga', which was founded as early as 1040. .
Groningen even has its own anthem: “Het Grönnens Laid”, which literally means 'the song of Groningen'. The text, in the dialect of the province, was written in 1919 by Geert Teis Pzn. of Stadskanaal and the music was composed by G.R. Jager of Slochteren. The song was arranged by Frieso Molenaar. 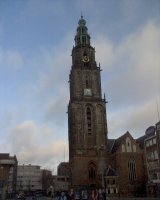 The province has about 575,000 inhabitants, 181,000 of whom live in the capital city. .
Groningen, the capital of the province with the Martini tower as its main landmark. Schiermonnikoog, one of the Wadden Islands and reachable by boat. In the second weekend on January, there is one of the biggest music conventions of Europe coming to Groningen. The days of the business people are filled with seminars at the Oosterpoort, but on thursday and friday evening there is music in a lot of cafés in the center of Groningen. If you want to watch a couple of the upcoming European bands before they become big, this is the place to be. On saturday there is Noorderslag an evening at the Oosterpoort with only dutch bands. Tickets for both events are limited. In 2013, the Dutch throne was passed on to King Willem-Alexander and what used to be Koninginnedag (Queen's Day) will from 2014 become Koningsdag (King's Day). The date will be changed to the 27th of April, which is the king's birthday. In 2014 however it will be on the 26th of April because the 27th falls on a Sunday. On this day the streets of almost every sizable town in the country come alive with activity. Groningen and other parts of the north have a slightly cooler summer as well as a colder winter on average compared to more central parts of the country. That said, differences are only little and the coastal areas enjoy more sun than inland parts. Groningen has international and domestic flights leaving from Groningen Airport Eelde, about 10 kilometres from the city centre. Destinations include Aberdeen, Antalya, Corfu, Dalaman, Faro, Heraklion, Kos, Las Palmas de Gran Canaria, Malaga, Palma de Mallorca, Rhodes and Tenerife. Although Groningen is the northern most city in the country, train connections are fast and frequent with travelling times about 2 hours from both Utrecht and Amsterdam. Check the National Railways website for details. From Groningen the national highway A28 runs south to Utrecht. Also the A7 is an important highway running from Bremen in Germany all the way to Amsterdam through the northern provinces of the Netherlands, crossing the famous Afsluitdijk, built to prevent floodings from the sea. If is a short route from the province of Friesland to North Holland, passing by Groningen. Groningen is one of the places in the Netherlands that is a destination of Eurolines. There is a ferry connection between Eemshaven and the German island of Borkum. Groningen does not have a lot of trainlines. There is one line going to the west connecting to Leeuwarden in Friesland, one going east, heading to Nieuweschans and from there into Germany, and two heading to the northeast with the destinations Roodeschool and Winschoten. There are only two motorways in Groningen, one is coming from the south (A28) and connects the city of Groningen with places further south, like Assen, Amersfoort and Utrecht, and Apeldoorn and Arnhem (via A50). The second motorway runs from the west to the east through the province which is the A7, this one connects to the A28 in the city of Groningen, and crosses the German border at Nieuweschans. To the west the A7 connects to Sneek in Friesland and if you drive even further across the afsluitdijk to Noord-Holland. For the rest of the province you have to rely on N-road (National routes), and because apart from the city of Groningen itself there is not too much traffic this serve it's function. Regional buses connect the smaller villages to the bigger towns like Groningen and Veendam. There are different companies running different lines. There is a busstation at the ferry terminal in Lauwersoog for the the ferry to Schiermonnikoog, busroute 163 connects this terminal and the city of Groningen. There are ferries from the mainland town of Lauwersoog to the island of Schiermonnikoog, one of the Wadden Islands and chosen in 2006 as the most beautiful place in the Netherlands. For details about schedules and fares of the ferry, check the Wagenborg website. Internet cafés are not as widespread as you would expect, but you can easily find one in the popular cities. Most hostels, hotels and camp sites have several computers, so you can keep connected with folk at home. Here is a list of internet cafés that could come in handy for travellers. Otherwise, most libraries have lots of computers and prices are around the €2-3 per hour range, although sometimes it can be even more expensive. Wireless internet access using wifi is becoming more popular and is usually available at most hotels and increasingly at train stations. Also in trains (at least in most first class wagons, but also more and more in second class) and some buses you can use wifi. Finally, places like McDonald's and Starbucks have free wifi, and smaller individual business like cafés and restaurants are on the rise too offering these services. More often than not, these service tend to be free of charge, though there might be a limited time you can use the internet. The country code for the Netherlands is 31. The outbound international prefix is 00. The general emergency number is 112, like many other countries. From internet cafés, it is also usually possible to make long distance international calls. Like in other countries, telephone booths have almost disappeared, though some are still found around public transport stations, where you can use a few coins to make calls. It is only recommended for local calls. The cellular phone network in the Netherlands is GSM 900/1800. The main providers of cell phone networks are KPN (Dutch only), T-mobile and Vodafone, who cover the whole country. Other operators, like Hollandsnieuwe, Simyo or Tele2, use one of these 3 networks basically. It is best to buy a SIM card when in the Netherlands for use in your cellphone, as this usually works out cheaper than using the one from home. If you are planning to study or work in the country and stay for several months, buying a cellphone is the best option. A simple one, sometimes with €10 worth on it, can be bought from around €25. The simplest smartphones are around €75. The rate for sending a postcard or letter up to 20 grams within the Netherlands is €0.64 (2014). Since 2010 there are stamps available for domestic post which no longer include the value in €. Instead, there are stamps available with either a '1' or a '2' as a substitute for value. The '1' can be used for letters and postcards up to 20 grams, while 20-50 grams require you to use the '2'-valued stamps (or two '1'-valued stamps of course). Sending items to other EU countries and the rest of the world (there is one price since 2014) will cost €1.05. Stamps are sold at post offices, supermarkets and smaller shops/kiosks; often the place where you buy your postcards can also supply you with stamps. Sending parcels abroad is more costly. A standard-sized parcel between up to 2 kilograms will cost you €9 for destinations within the EU and €18 (both without Track & Trace) to the rest of the world. Prices with Track & Trace start at €13 and €24.30 respectively. Parcel service is available from major post offices only; standard-size boxes are on sale there as well. For sending parcels, it might be just as competitive and fast to use a company like TNT, UPS or DHL. If you need to receive mail while moving around, you can have it sent poste restante (to be called for) to a post office of your choice, where it will be kept for a month. If you come to claim it, bring a valid ID, and make sure to have told the sender that the name on the envelope must be an exact match with that in your passport. For addresses of post offices, as well as more information, consult the TNT website. This is version 21. Last edited at 14:38 on Sep 1, 15 by Utrecht. 11 articles link to this page.